In the aftermath of the three-day carnage that took place at its doorstep in early July, the hamlet of Gettysburg found itself surrounded by thousands of bloating corpses. Soon after the battle, torrential rain exposed the bodies lying in their hastily-prepared shallow graves. The arrival of summer's humid heat brought with it the nauseating stench of decaying flesh that attracted swarms of flies and marauding pigs to the former battlefield. Something had to be done. The bodies of the fallen had to be given a proper internment. Pennsylvania Governor Andrew Curtin appointed David Wills, a prominent Gettysburg lawyer, to oversee the project. An interstate commission was formed, money was raised, and seventeen acres of land at the battle site purchased. The federal government provided the coffins. By November the cemetery was ready for dedication. Lincoln was not the featured speaker of the day. This honor fell to Edward Everett, a noted orator from Massachusetts. The President had been invited to attend the ceremony at the last moment (November 2) with the expectation that his busy schedule would not allow him to attend. The organizers of the event were therefore surprised when Lincoln not only accepted their invitation but also indicated that he would like to say a few words at the ceremony. Lincoln wanted desperately to speak at Gettysburg. It was an opportunity to boost the Union's war effort and to solidify political support in the state of Pennsylvania. However, his attendance at the ceremony was threatened at the last minute by the sudden illness of his son Tad. This was a serious matter. Lincoln had already lost two of his four children to disease. However, despite his concerns and the near-hysterical entreaties from his wife Mary not to leave, he was determined to travel to Gettysburg. 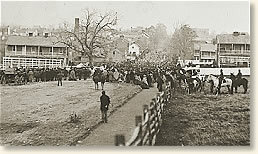 Lincoln arrived by train in Gettysburg the night before the dedication and stayed at the home of David Wills. At around 10 o'clock the next morning (November 19) the President joined the procession that ended at the cemetery just outside of town. A crowd of fifteen to twenty thousand crowded around the speakers' platform. Everett spoke first, holding the audience spell-bound for almost two hours. Lincoln then rose and delivered his address in less than two minutes. The audience's response was muted, probably due to surprise at the brevity of the speech. Seeing his audience's reaction, Lincoln remarked to a companion: "It is a flat failure and the people are disappointed." However, the following day, Everett wrote the President praising his speech and pronouncing it one of the best he had heard. As the words Lincoln spoke that day were spread by the newspapers, public reaction concurred and Lincoln's few sentences have come to be regarded as one the best speeches in American history. "A "half dozen words of consecration." The night before the ceremony, crowds of boisterous celebrants filled Gettysburg's torch-lit streets and shouted for impromptu speeches from the dignitaries staying the night. Alcohol flowed freely while the music of several strolling bands of musicians filled the air. A rare photo of the ceremonies. A group of boys stand at the fringe of a crowd. be seen standing on the speakers' platform. the image of Lincoln sitting to the left of these men. We went back to Forney's room, having picked up Nicolay [another of Lincoln's private secretaries], and drank more whisky. Nicolay sang his little song of the 'Three Thieves,' and we then sang 'John Brown.' At last we proposed that Forney should make a speech and two or three started out, Shannon and Behan and Nicolay, to get a band to serenade him. I stayed with him. So did Stanton and MacVeagh...I walked downstairs with him. The crowd was large and clamorous. The fuglers [military guards]stood by the door in an agony. The reporters squatted at a little stand in the entry. Forney stood on the threshold, John Young [a reporter] and I by him. In the morning I got a beast and rode out with the President's suite to the Cemetery in the procession. The procession formed itself in an orphanly sort of way and moved out with very little help from anybody, and after a little delay, Mr. Everett took his place on the stand - and Mr. Stockton made a prayer which thought it was an oration; and Mr. Everett spoke as he always does, perfectly - and the President, in a fine, free way, with more grace than is his wont, said his half dozen words of consecration, and the music wailed and we went home through crowded and cheering streets." John Hay's account is found in: Hay, John, Lincoln and the Civil War in the diaries and letters of John Hay (1939); Kunhardt, Phillip, B. Lincoln at Gettysburg (1983); Sandburg, Carl, Abraham Lincoln: the War Years (1939). 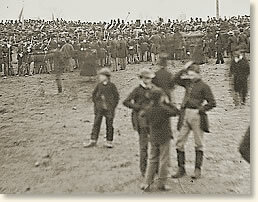 "Lincoln's Gettysburg Address, 1863" EyeWitness to History, www.eyewitnesstohistory.com (2005). The author of this eyewitness account, John Hay, became Secretary of State for Presidents McKinley and Theodore Roosevelt.